Tanai Township, Kachin State — Mining officer Myit Aung knocked on the door, stirring me from a deep sleep. By June 16, only KIA soldiers remained in Noi Je Bum Patserm Maw, an amber mining village. 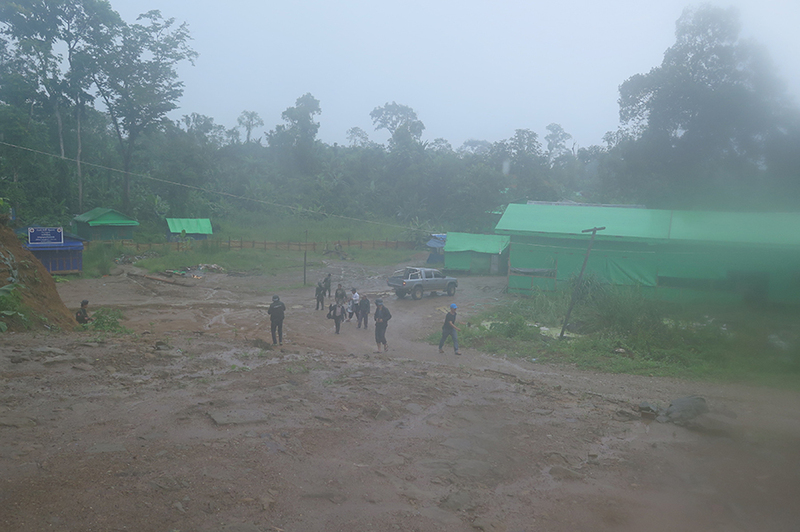 All of the civilians, including the ethnic armed group’s mining officers, had left the area’s amber and gold mines in the expectation of a coming attack from the Myanmar Army. Many internally displaced people (IDPs) had already experienced the violence since fighting broke out on June 6, fleeing to Tanai town in Kachin State. We discussed whether we should visit the frontline for a second time or join the mining officers on their journey back to town in Tanai Township. The mining officers had provided us with food and transport on our first trip to the frontline. Without them, we would have had to find and cook our own food, as the KIA troops would be too occupied with the battle. Our accommodation would have been one of the 300 or so houses in the abandoned village of Nam Kham. From there, it is at least a five-day jungle trek back to Hpakant Township, with parts of the route potentially blocked by flooding. Besides our dearth of experience at such a trek and our heavy backpacks, there was the danger of bumping into the Myanmar Army, which had announced via leaflets dropped from helicopters on June 4 that anyone remaining in the mining areas would be recognized as insurgents. Finally, we decided to return with the mining officers. The KIA troops held a meeting at 8 a.m. and then set about moving all the amber, guns, and other equipment from their offices, before driving their fighters to the frontline. They told us we would be the last to leave. The Myanmar Army, also known as the Tatmadaw, was getting closer, they said, and had clashed with some KIA troops at the frontline. Fighting may break out soon, they said. Uneasy, we rushed our meals and two bottles of a traditional Kachin drink—strong rice wine mixed with plant roots—an unmanageable feat to finish, as the troops arrived to collect us at 2 p.m.
After driving for an hour, we arrived at the boat stop and, fortunately, the Myanmar Army had not blocked the river route. We took a boat for another hour, removing our KIA army boots before disembarking. The group has given us the boots for trekking to the frontline, but we feared Myanmar Army troops would know we had come from the frontline if they stopped us. On the road back to Tanai town, we held our breath passing two army checkpoints, but we were not stopped—we had passed for IDPs—and, after arriving at our guesthouses, we let out a collective sigh of relief.